To preface this little tale, Brad Cascagnette, Gabe Flock, and I were on our last day of vacation. It was the end of March 2000. The previous couple days had been spent exploring the North Fork of the Trinity, and then the East Fork of the North Fork. One had been a long, serious, class IV-V wilderness descent; the other had been lazy but scenic class III. After that rest day, we decided to drive downstream to check out the New River. 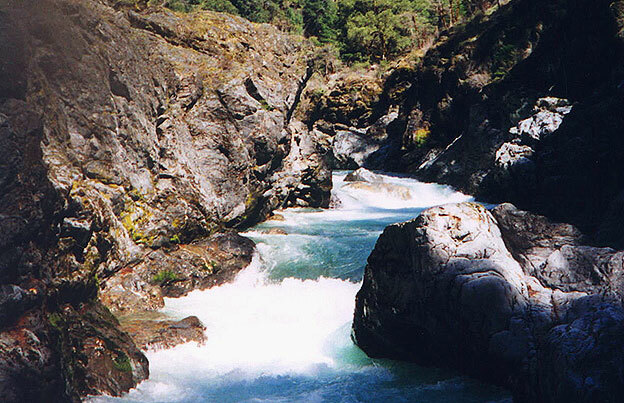 According to the Holbeck and Stanley guidebook, the New was a class IV(V) river that bumped up into class V- when flowing with better than 800 cfs. We all guessed the New was flowing with about 1000-1200 cfs. Compared to the two previous runs, this one looked like a true river. 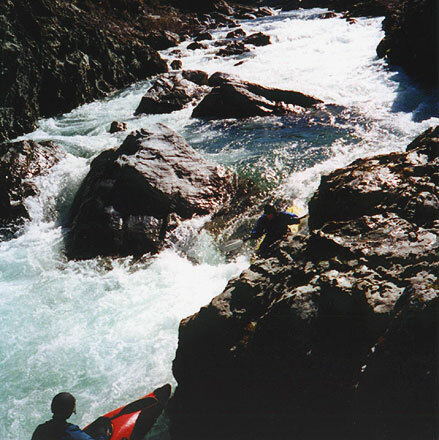 Fast technical class III rapids characterized the first mile below the put-in. Easy stuff, but kind of pushy after running 250 cfs stuff on the East Fork of the North Fork the previous day. After that first mile, the walls started to close in and go vertical. We soon saw the river drop over the first horizon line. A quick scout relieved our curiosity. 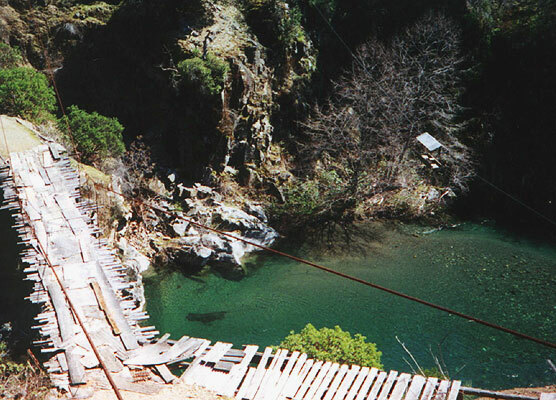 Two steep drops separated by a short flat pool. Number One required crashing through a large hole, bracing hard in some funky currents, and basically staying upright as you dropped down about 6 feet. It was a hoot. Gabe and I ran through with no mishaps; Brad got squirted in his Micro 240, flipped, and pulled a fast roll to catch the eddy prior to Number Two. Again we hopped out to scout. The second drop looked a bit burlier and in the class IV+ range. We sneaked the entry by heading down a narrow slot on the far right (thus avoiding a rock that seemed likely to generate a mid-current broach in the main channel), and finished it off by boofing a small ledge into a fast run-out. These two drops were a perfect introduction to boating on the New; very steep class IV+ drops with burly currents and holes. Usually everything was gorged out, so combining the technical difficulty with the sticky holes lent the run a serious class V- feel. Gabe slides into Number Two; Number One is in the background. These initial ledge drops led into longer boulder slaloms. Again the water just always seemed to be pushing the wrong way, and evidence of undercuts was all over the place (along the walls and under the boulders). Soon we caught an eddy on the left above another steep 3-foot drop that looked like it held a serious hole. The hole on that drop was positively ugly. After watching Gabe and Brad punch through fairly readily, I thought my (larger) Skreem would cut through like butter. WRONG! I hit that sticky beast hard, but stalled went semi-vertical and then clawed my way along the river left wall to get out. My paddle hated the contact with the rock, but I was grasping at straws. Getting stuck in that reversal would have guaranteed a swim, and there was another steep class IV+ a dozen yards downstream. The river continued to alternate between flat stretches and steep, burly class IV+ drops. A couple proved pretty memorable. The first looked like a nondescript 2- foot drop best taken along river left. I was up front, and just as I committed to running that side I saw a large flat (and apparently undercut) boulder lurking inches under the water a couple feet downstream of the drop. It scared me. At the last moment I swung my boat sideways as I slid over the initial drop; this allowed me to brace against the boulder and sort of surf my way to its edge. I'm thankful I had time to do this; I'm pretty sure coming off that drop pointed forward would have led to a bad entrapment. I quickly turned around and waved the other guys to the right channel. Unfortunately Brad decided to exit the right channel through a boulder pile in the center. He pinned, but was stable, and after a couple minutes of working managed to get himself freed of the predicament. Gabe avoided it altogether by staying far right the whole way. The second memorable series was just downstream. We tried to scout by exiting our boats in some big potholes and climbing up the right wall, but found we could only safely climb about 15 feet. What we could see was a series of holes leading into a big ledge drop, then the current whipped to the right and around a blind corner. The ledge was backed up by a BIG hole, and there appeared to be no eddies available to stop prior to being swept around the corner. This drop we took on faith in a prayer. Gabe led. He flipped below the big ledge, but managed a quick roll and disappeared around the corner. Brad went next, and I brought up the rear. The last I had seen of Brad was him trying to scramble into a small eddy above the blind corner and then falling out of it backward into the unknown. I punched over the big ledge (5-6 foot), settled down a minor backender, and then saw what the corner had hid. A horizon line above a tight twisting 12-foot wide slot and no way to stop. Gabe was out of his boat and yelling something, but I was completely focused and didn't hear a word. It looked like the horizon line might be better on the left (most of the water was going right). So I charged over what turned out to be a 5-foot ledge, caught the corner of a DEEP hole, and then shot out the final slot by moving quickly to the left to avoid getting slammed along a monstrously undercut projecting wall on the right. As I recovered from adrenaline overload, I learned that Brad had just survived the misfortune of taking the drop backwards! I was not envious of his experience. I've nicknamed this class V drop, "Blind Double Date". Double Blind Date rapid from below. After another short flat stretch the river dropped through the longest and steepest rapid. Another class V. This one had me worried enough that I would have portaged had the rapid been shorter. For the first 50 yards the river dropped over a series of 3-foot ledges and boulders. Towards the bottom nearly all of the water pushed hard towards river left, and that was definitely where you did not want to be. The exit choked down to about 20 feet, and had a 10-foot wide boulder sitting squarely in the middle! The left side slot plunged directly into a badly undercut wall, the boulder appeared undercut to some degree, and only the right slot held safe passage. Even it had most of the current plowing directly into (and under?) the side of the boulder. It looked like the only sane way to run the rapid was to start as far right as possible, fight the current going left, and find your way out of the main channel and into a boulder garden along the right wall. Then just as you were dropping through that final ominous slot, a deft draw on the right should pull you safely away from and past the boulder clogging the exit. At all costs you did not want to get broached end-to-end across the exit slot! I've had a most unpleasant swim (and broken boat) induced by such perilously narrow slots, but I didn't relish attempting the long difficult portage. Gabe again was our probe unit. He appeared to effortlessly clean the entire rapid. I didn't quite duplicate Gabe's stellar line, but once that slot was behind me I was a much happier person. 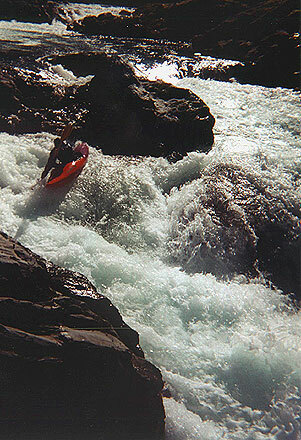 That was the last difficult rapid. The river held a couple more class II-III surprises, but basically mellowed into moving flatwater on the way down to the takeout. Soon we saw the rickety old mining bridge. This was the last obstacle. A steep climb up about 30 feet and then an equally perilous crossing over the ancient bridge and onward to our vehicles. The bridge at the take out.